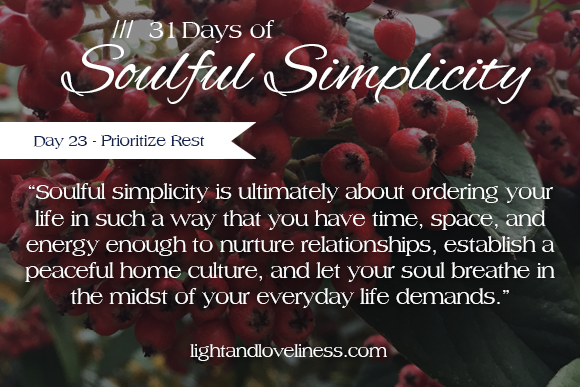 This is day 23 of Soulful Simplicity, a 31-day series through the month of October. The series can be found here, and I hope you find it enriching and encouraging. If you have any questions or would otherwise like to connect, feel free to send me a note: lightandloveliness [at] gmail [dot] com. Soulful simplicity is ultimately about ordering your life in such a way that you have time, space, and energy enough to nurture relationships, establish a peaceful home culture, and let your soul breathe in the midst of your everyday life demands. I have learned that it is not possible for me to do any of these things well if I am starting off the day exhausted, or if I’m trying to push myself too far beyond my physical limits. Our limitations can be frustrating, but they’re also important. Limits help us keep a measure of balance in our lives…sometimes against our wishes. True, I would, but that statement reveals a bit about what was most important to me in that stage of my life. It also reveals how little I understood my need for adequate and restorative rest. I valued productivity over all other things. Now, I still love productivity—very much—but I also see that living whole-heartedly is about so much more than having a list of accomplishments to show for my time spent. I still struggle with this aspect of soulful simplicity. I am not good at resting, but I have experienced first-hand that when I prioritize rest and intentionally make it part of my life in different ways, it provides so many benefits that I can’t ignore it. If you feel constantly exhausted, I would encourage you to build rest and refreshment into your week. To help you think about ways you can begin or improve your intention for rest in your life, I am listing some of the ways I prioritize rest in mine. 1—I set early bedtimes for the kids, even our older ones, so that my evenings are typically an open space for me to tend my soul through writing, meeting up with a friend, studying the Bible or doing a creative project. 2—On the days we are home in the afternoons, I have everyone do quiet/rest times to recuperate from our morning activities. The little ones take naps and the older ones read or play quietly in their beds. 3—I schedule a “rest” day on my weekly calendar where I plan a little ahead so I have at least a small reprieve from the constant household tasks (meal-making, laundry, cleaning, etc). Sometimes I am only able to do it for half the day, but I find the intention to give myself that space helps me tackle those tasks with more diligence at other times during the week. 4—I consolidate as many tasks as I can in order to “gain” time later. This refers to creating household systems that allow me to give consistent effort in the same direction to what needs to be done, so that when I set them down for a stretch, I don’t feel like I’m stuck behind the curve. 5—I communicate with my family about what I need from them in order for our home care to be shared among all of us. I still do a majority of home tasks, but having help from the others encourages me a lot and helps me get through tasks more quickly. 6—I try to make time monthly or quarterly for a quiet retreat to re-group. For me, this is typically a simple date alone at a coffee shop for some hours to myself, but it could easily be an actual getaway to be refreshed. 7—I re-evaluate my schedule every so often and simplify my commitments, so I can be sure that everything I’m giving my time to is something I am able to joyfully give my time to. 8—For my heart, I thoughtfully disengage from social media for a periods of time so that I am not overwhelmed with all that input. 9—I have found that I really enjoy contemplative prayer and reflective writing. Both help me to clear my mind of all the things that cause anxiety and help me to find my center. 10—For me, time conversing with a friend (in person or on the phone) is incredibly life-giving. I could be dragging along all day and then share a bit of time talking with someone I care about and I am re-energized and ready to face the rest of my day. What would you add to this list? How do you prioritize rest? I have some exciting things to share in the near future, and would love for you to be among the first to hear about them. If you’re so inclined, please sign up for my email newsletter here and I’ll send out updates as they become available. Your address will never be shared. Thanks! Could you elaborate on #4: your household systems? You have good ideas in this post. Thanks!